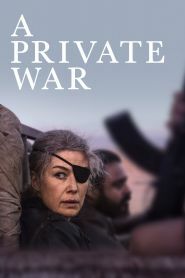 A Private War manages to be simultaneously appalled by the humanitarian crises it depicts...and honest about the thrill that visiting such hot spots offered to someone who found it hard to readjust to her life in London between assignments. By the time the narrative comes to Colvin’s greatest get — she was essentially the first Western journalist to get inside Homs and refute Syrian President Bashar al-Assad’s bold-faced lie that he wasn’t bombing his own people into oblivion — the price of that sacrifice, and the power of her story, feels finally, fully real. Whatever her private battles, War works hard to be the public reckoning her work deserves.